Stephen Baxter is very good at those two-page pieces of speculative scientific punditry -- the kind of thing you read first upon flicking through Matrix or New Scientist, just to see where his whatiffery will take him this time. Deep Future (not to be confused with Eric Brown's short story collection of the same name, also published this year) compiles and rewrites these pieces into book form, much as Clarke and Asimov and other éminences grise of the genre have done before with their own essays. I read Clarke's Profiles of the Future and his other non-fiction books at a formative age and was stunned by the breadth and depth of their extrapolation; a comparable reader may react the same way to Baxter's Deep Future and it came close for me, too, although for a real dose of that breathtaking speculation you should turn to Baxter's fiction instead. There are dangers with books like this, and the author copes with them with varying degrees of success. There's the danger, for instance, that the whole thing may simply be an exercise in Big Name indulgence: slap that name on the cover of just about any bunch of words and the book will sell, a bit like all those out-takes albums that have plagued us in recent years -- historically interesting, enjoyable simply because it's one of our top authors at work, but by no means a White Album. Perhaps... but Deep Future is better than that. 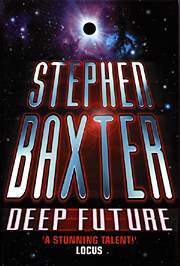 The danger that Baxter hasn't really contended so successfully with is one of packaging: for all its good points -- and there are many -- Deep Future is unevenly paced and is not the book I had anticipated when I started to read it. 'For ever' means surviving the deep future, far beyond the death of the stars, when everything about the universe will have changed. Is that possible? Despite such grand ambition, Deep Future takes an awfully long time to leave the here and now. The book opens with a high speed dip into futurology and the nature of prediction (in which Baxter makes the bold claim that "If we continue to survive, our future must be something like that depicted in this book"); there follows a much slower look at the history of the space race; and then eventually we reach the leaps and bounds of speculation about human futures and our place in the universe which I had hoped for and expected. The pacing is, in short, all wrong. All the space stuff is fascinating. Baxter is a very perceptive commentator on NASA, on where the space race went wrong and how we might put it right again, as any reader of his fiction will know. But it means that at least half of this book is concerned with near-history and near-future, despite the big claims at the outset. It's all very well to set speculations in context, but there's a distinct sense here of an author being sidetracked -- perhaps a legacy of these essays' publishing history, or perhaps simply a case of the author's true concerns taking over. There appears to be at least two books vying for space here: the Clarkeian futurology sitting a little uncomfortably alongside the analysis of space history. The former is what Deep Future appears to want to be and despite my quibbles, it does a decent job. But the latter book would be the logical conclusion of much of Baxter's fictional concerns and if and when he produces such a book it could easily be better than anything else he has written. Let's return to that grand claim at the outset: "If we continue to survive, our future must be something like that depicted in this book." What a bold claim! And yet, as the author points out, many professionals make a good living from the rational prediction or forecasting of future events and trends, and he doesn't mean astrologers. But as he also points out, much of history is rewritten and retold, casting whatever really happened in a suitably positive, or simply interesting, light: the human mind "seeking story" from the mess of memory. And yet, isn't Stephen Baxter guilty of just that? Despite his claims to scientific method, is he not just "seeking story" in the mess of the future, the chaotic babble of discontinuity and noise that lies before us? Well, clearly he is: we've all seen future histories laughably wrong in the fine detail, and the author steers admirably clear of much of that as he guides us into his future. But the story he finds in that future is a compelling one and he makes a good case for the possibility of at least being able to pick out the main narrative threads of what is to come. Okay, so I'd hoped for more than this, or at least had expected something different, but I'm only a little disappointed by what I found. As Baxter himself takes pains to point out, the future is, in many ways, knowable, and others have been there before, painting the broad strokes of our future among the stars. Deep Future is, despite this, a valuable addition: doing this futurology thing for a new generation, knocking the out-dated errors off previous efforts and throwing in nanotech, environmental awareness and other 90s/00s concerns. Even if, for a work of futurology, Deep Future dwells an awful lot on the here and now. stories by Stephen Baxter - The Gravity Mine; Raft; and Moon Six. nonfiction - Stephen Baxter interviewed by Nick Gevers; read reviews of Stephen Baxter's novels and collections.